When China decides to invest in a specific industry sector for the good of their economy, they can fundamentally change the macro economic landscape of the globe for that economic sector. That’s exactly what China is doing by putting their economic might behind the development of the Hydrogen Economy. We have all seen this story before with solar arrays & renewable energy in China. The header image of a smog-filled Guangzhou skyline in this post is clear demonstration of both why China is embracing renewable energy and why they must. China has stepped up efforts to incentivize the growth of renewable energy and now has over 600 GW of renewable generation capacity and produces over 60% of the world’s solar cells annually. It took many years for China to affect economies of scale for solar cells, but we can now buy solar panels that have reasonable economic pay back thanks to China; it didn’t always used to be that way. Let’s examine why China is now putting hydrogen into their strategic energy plans with policies & incentives, just like they did for solar panels many years ago. How Did China’s Air Quality Become So Poor? China produced 3.2 billion tons of coal in 2016, or 44% of the world’s total, according to the International Energy Agency. China was also the top importer of coal in 2016. Coal plant capacity in China reached 942 gigawatts in 2016, up 42 GW from the previous year, according to the China Electricity Council. Burning coal releases invisible CO2 as well as nitrous oxides and particulate matter you see as smog in this post’s feature image. Diesel & gasoline vehicle exhaust also release CO2, NOx, & SOx pollutants, which compound China’s air quality problems from burning coal. While coal use is not going to stop any time soon, China plans to mitigate the effects of coal in a hydrogen economy by using modern coal gasification technologies with carbon capture & sequestration just like RMP has written about here. Getting the hydrogen they need from coal without polluting their air or water, China can begin a ramp down of coal use. One day, Chinese cities can enjoy blue skies and clean rivers. By using advanced coal to chemical technologies coupled with wind & solar generation China can have a one-two punch that tackles all their energy needs with no pollution. China can be energy independent and carbon neutral in just a few decades. The manufacture of hydrogen is a common denominator that makes a clean, sustainable, and job filled economy possible regardless of a country’s energy feedstocks. For many years President Xi Jinping has been consistent with his messaging about overhauling China’s energy infrastructure. In 2013 the Chinese government released their air pollution action plan. In 2014, President Xi Jinping called for “4 revolutions” and “one cooperation” for energy. 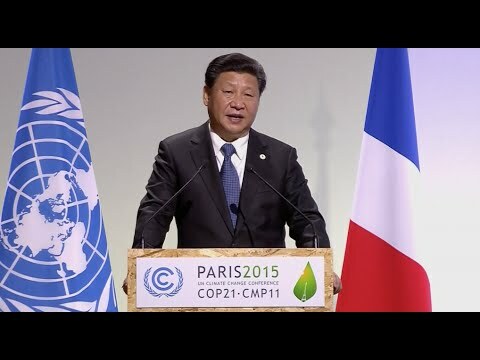 Chinese President Xi Jinping speaks about China’s solemn promise to reach peak carbon emissions by 2030 at the Paris Climate Conference (aka COP21) in 2015. Hydrogen fuel cells play a big part in China’s plan to reduce carbon emissions & clean up their air and water. In May of 2015, the Chinese Government published the “Made in China 2025” initiative, a ten-year plan to comprehensively upgrade China’s manufacturing industry. The plan highlights 10 priority sectors including New-Energy Vehicles & Equipment. Based on the New-Energy Vehicles and Equipment Plan outlined in “Made in China 2025”, in October 2016 the Strategy Advisory Committee of the Technology Roadmap for Energy Saving and New Energy Vehicles and the Society of Automotive Engineers of China (SAE-China) jointly published the Energy Saving and New Energy Vehicle Technology Roadmap, the Chapter 4 of which is the Hydrogen Fuel Cell Vehicle (FCEV) Technology Roadmap. In December of 2016, H2 new energy vehicles & hydrogen infrastructure was included in the “13th Five-Year Plan” as evidenced in the direct snip (table 3-1) from page 18 of 40 in the Fuel Cell Vehicle Technology Roadmap shown below. China’s development course in the hydrogen economy is similar to forecasts by fuel cell manufacturers in Canada like Hydrogenics & Ballard Power as well as US manufacturers of fuel cells like Fuel Cell Energy & Plug Power. 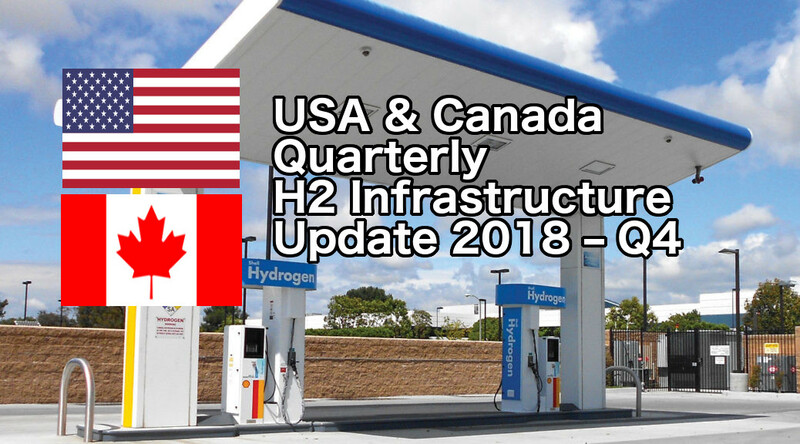 Hydrogen infrastructure is poised to grow out of a gestation period that has been developing over the past few years. The forecasts for growth in hydrogen production, distribution, and equipment sectors are on the cusp of a major breakout for 2020. As RMP wrote years ago, the official coming out party for hydrogen fuel cells is the Tokyo Olympics in 2020 where Japan will put on a show to demonstrate how hydrogen is the common denominator in their economy for the next 100 years. Two years after the fuel cell & hydrogen show in Toyko 2020, China will compound on it in a big way at the Beijing 2022 Winter Olympics. In fact, a hydrogen refueling station (HRS) has been built already in Zhangjiakou, which is a cold city northwest of Beijing that is a co-host location of the 2022 Winter Olympics in Beijing. The station on RMP’s new map of HRS in China is located at the Zhangjiakou Bus Station. Check out RMP’s new interactive Google Map of all 16 HRS in China by clicking here. China plans to have over 100 FCEBs in service in Zhangjiakou in 2022 and another HRS is set to open in the near future. At the 2008 Beijing Olympics, China demonstrated 23 fuel cell buses & 1 HRS to supply them. From 2008 to 2010 was a gestation period of hydrogen fuel cell development. At the 2010 Shanghai World Expo, China demonstrated 196 fuel cell vehicles & 1 HRS to supply them with fuel. From 2010 to 2015 has been the “start up period” for the hydrogen economy. On December 9, 2015, the first domestic FCEV model was listed for sale commercially in China. 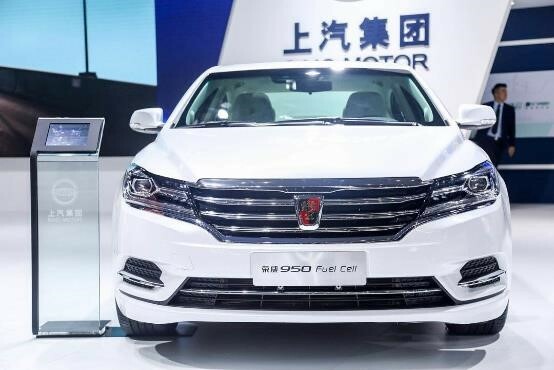 From 2015 to 2018, we have been in the growth period of the hydrogen economy in China with over 45 different hydrogen fuel cell vehicles listed as commercially available across all provinces as of May 2018. The hydrogen infrastructure in China continues to grow with 16 HRS in operation & hundreds of FCEVs in operation. The new Rugao station will supply over 1000 kgs/day of H2 which can help get more vehicles on the road now. Growth of hydrogen infrastructure in China is picking up quickly now as we head into 2019. RMP has 16 HRS locations on our new map you can see here. RMP’s new interactive Google Map of HRS in China is now live. You can play with it, zoom in, zoom out, click on stations for additional information and more. In the future you will be able to drill down to get even more data from each location and even upload your own information to share with others using the map. The check out RMP’s new interactive map, just click here. The Chinese Government is giving substantial subsidies to manufacturers in the fuel cell sector. Some local municipalities in Shanghai & Wuhan are actually getting dollar for dollar matching on investments in fuel cell manufacturing! China has plans to dole out over 100 billion Chinese Yuan (about $14B US Dollars) to cover these generous subsidies to get the hydrogen economy off the ground & self-sustainable. China is also helping with the about $2M USD cost of constructing a 1,000 kg/day HRS with plans to build about 500 stations in Yangtze River Delta along major truck arteries. For reference, there are about roughly 140 million people living in the Yangtze River Delta metropolitan area with an annual GDP of over $1.5 trillion USD. Because of generous incentives, the number of companies operating in the fuel cell sector in China has grown rapidly from 28 New + 32 Existing (total=60) from 2006-2010. From the years 2011-2015 there were 63 New + 60 Existing companies (total=123) in the fuel cell sector. From the years 2016-2017, there were 92 New companies & 123 Existing (total=215) in the fuel cell sector. This rapid growth of companies participating in the hydrogen economy came to a head in February of 2018 when seventeen key companies formed the China Hydrogen Alliance in Beijing with CHN ENERGY serving as chair. Subsidies for fuel cell electric vehicles are substantial and have helped give incentive to manufacturers in the fuel cell sector. The number of manufacturers has grown from less than 60 in 2006 to over 215 as of last year. Click here for source. The significance of CHN ENERGY as the chair of the China Hydrogen Alliance should not be understated. China Energy (CHN ENERGY) was formed in the 2017 merger of the Shenua Group and the China Goudian Group. China Energy is the largest power company in the country having over ¥1.1 Trillion ($286B USD) in assets under management, over 350,000 employees, and accounts for 15% of China’s electricity production. China Energy mines over 480 million tons of coal each year & produces over 15 million tons of chemicals. China Energy has 226 GW of installed electrical generation capacity of which 30 GW is from renewable energy. China Energy also operates 1,339 miles of rail from which they receive an additional 270 million tons of coal each year from ocean port. If you’ve been following & reading RMP articles for a while, you’ve read about coal gasification & CO2 sequestration in previously published posts. Through the wonderful science of chemistry, some of the most talented chemists in the world are converting coal to its constituent chemicals like hydrogen, carbon dioxide, sulphur, & mercury for sale to other industries with very limited emissions to atmosphere or waterway. Besides the pay products from the coal, the waste by-product of coal gasification is an inert slag that can be used as a road making material. China Energy has a coal to chemicals business unit that will obviously have a keen interest in making hydrogen from coal with CO2 sequestration if China is to reach its commitment of peak CO2 output by the year 2030. China Energy (aka CHN ENERGY) has been named as chair of the Hydrogen Alliance of China. CHN ENERGY has a strong footprint across China with key locations shown above. CHN ENERGY produces approx 15% of all of China’s electricity with 226 gigawatts of total generation capacity. CHN ENERGY has over 30 gigawatts of renewable generation capacity and operates over 1,339 miles of rail to import over 270 million tons of coal per year from ocean ports. China Energy has a solid industrial footprint across several Chinese Provinces throughout the country. They are behind the recently built Rugao Station in Jiangsu. The Rugao HRS will be China’s first to meet the dual 35 MPa & 70 MPa international standard. The station will have a 586 kg storage capacity and 1,000 kg/day dispensation capacity. Tongji University in Shanghai has been doing fuel cell research & development for over 17 years. Looking all the way back to 2001, the first fuel cell vehicles they were putting on the road were using only 20 kW stacks. Tongji University was on hand at the Olympics in Beijing in 2008 and has been partnered up with UC Davis for a long time too. Going all the way back to 2006 when UC Davis researchers in California helped write the standards for the CARB’s Low Carbon Fuel Standard for implementation under AB 32 The Global Warming Solutions Act signed by Gov Arnold Schwarzenegger. Currently in 2018 there are over 200 fuel cell electric vehicles in operations at Tongji University. Tongji’s 4th generation fuel cell stacks are now (in 2018) bench testing about 5,000 hours endurance & 100 kms per 0.9kg of H2. SAIC Motor in Shanghai has vehicle designs, a full supply chain, and manufacturing capabilities now for mass manufacturing of fuel cell equipment. There’s the Rongwei 950 FC Sedan with 430km range. There’s the Datong FCV80 passenger van with 490 km range. Another vehicle ready to go for mass manufacturing is the Shanghai Shenwo Fuel Cell public bus which can travel further than 100km per 8kg of H2. 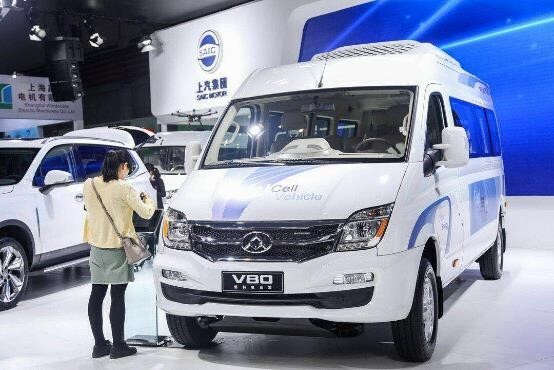 Many other companies like Dongfeng, Yutong Bus, and Great Wall Motors in China are ready for mass manufacturing of fuel cell cars, trucks, & busses. China is also demonstrating fuel cell rail applications like the demo in Tangshan in October of 2017. On the supply chain front, we see companies like Tinhai in the high pressure tank sector starting to ramp up to mass production. These scale up steps are driving down costs of carbon fiber wrapped tanks for FCEVs that can hold H2 at 700 bar pressure. 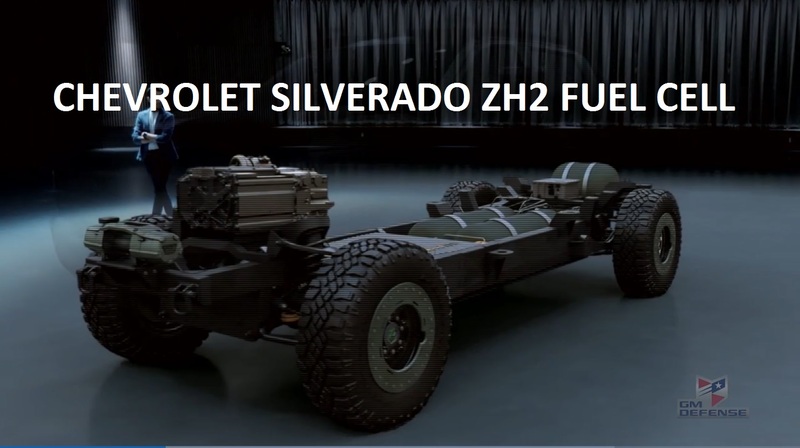 H2 tanks are a key high cost component on FCEVs that can drive the overall cost of vehicles down as economies scale up. The China Iron & Steel Research Institute Group is working with fuel cell manufacturers to drive down costs of key stack components like metal bi-polar plates & gas diffusion layers. Waste gases, renewable energy, & coal with CCS are smartest economic pathways to making H2 in China. Natural gas is not as competitive but may become more competitive through use of LNG. I recently finished creating an interactive Google Map of 16 HRS in China, which you can view by clicking here. 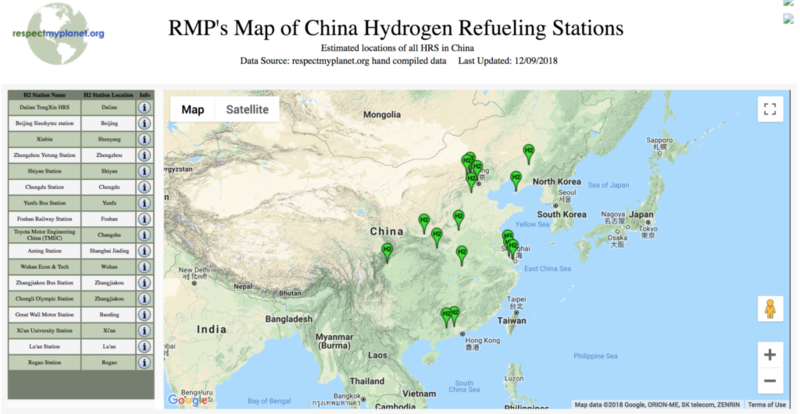 I plan to continue to work on and develop this map as new HRS come online and as we learn more about hydrogen infrastructure in China. If you can afford, please consider making a tax-deductible donation to RMP by clicking here. RMP is a 501(c)3 organization registered in Michigan and all donations go toward helping RMP share our educational maps about water protection & sustainable energy initiatives. Our main mission is to educate people about sustainable energy & waste management in order to protect the Great Lakes. Thanks for reading. Please like us on facebook and follow us on Twitter if you want to join us in chronicling the development of the hydrogen economy wherever it takes us around the world. 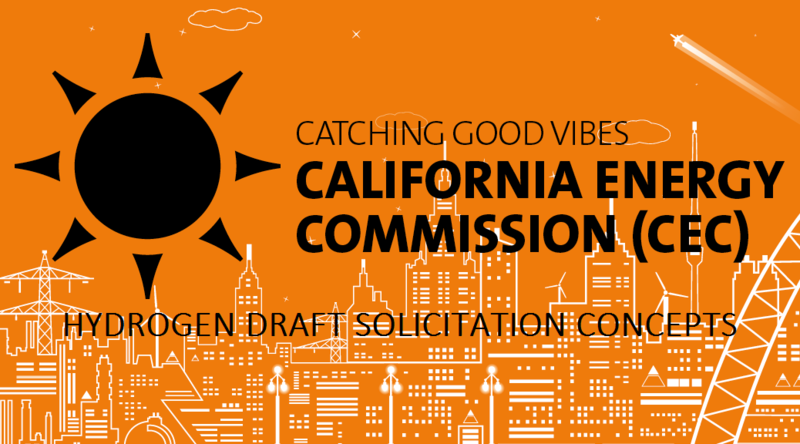 Much of the information in this post comes from this publication from Jimmy Li from the National Institute for Clean & Low-Carbon Energy which was prepared for the US Department of Energy. Thanks Bente. I fixed the map link. I have been upgrading my maps and plan to add more maps & features over the summer. Forgot to copy over some changes from my localhost to the internet. Please try the link again and it should work. Thank you for letting me know the map link was broken. If you have any more info for station locations in China, please let me know. Feel free to email me at respectmyplanet at gmail dot com. I found the article you referenced too, thanks.